Municipal IQ has six different performance indices measuring issues such as municipal productivity, poverty levels, audit results, compliance and governance, as well as a developmental credit risk index. We also have ten monitors monitoring issues as diverse as expenditure and revenue levels to backlogs and changes in transactional banking issues as diverse as expenditure and revenue levels to backlogs and changes in transactional banking. Municipal IQ's local government publication service has five different types of publications: 1. 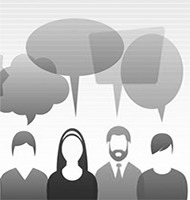 We publish 4-6 briefings a month on topical issues in local government. 2. We publish a weekly news review, analysing local government stories in the press. 3. 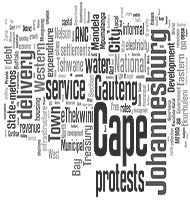 We publish a monthly "newsmaker municipality" profile on municipalities hitting the headlines. 4. We publish periodic Municipal IQ product profiles discussing our different products. 5. We publish a number of larger research reviews. Municipal IQ has five different profile types. 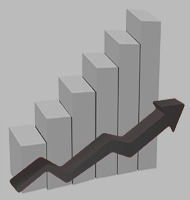 Profiles are carefully constructed to be user friendly and are packed with information. 1. 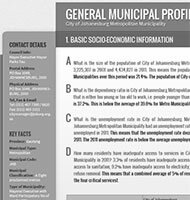 We have a General Profile and a Strategic Snapshot for each municipality containing a snapshot of information. 2. The Performance Profile presents and analyses the performance of a municipality on our different indices and monitors. 3. The Credit Risk Profiles discuss and analyse a municipality's performance on our Developmental Credit Risk Index for Municipalities. 4. The Provincial Profiles provide a summary of each municipality in a province. Municipal IQ is small enough to guarantee close contact with our clients and users. Our data query service ensures that we are only ever a phone call or email away from users and are able to assist with quick questions on data issues in local government or use of our products. We also interact regularly with clients in our periodic roundtables which discuss important issues in local government.